Kathy LeMay is the founder, president and CEO of Raising Change, a fundraising organization that works to advance social change agendas and philanthropy worldwide. Here, she explains what financial security means to her. I fired my financial planner. What's more, I didn't hire someone to replace her. She was competent, knew her industry, and had a deep desire to help people secure their financial future; this is why I had initially sought her out. I had bought a house and was making more money than ever. I kept it in a checking account but didn't do anything else with it. I heard friends talk about diversifying their portfolios and read stories on CNN Money about how much I needed to save to be comfortable when I reached age 66. I surmised that taking care of my finances was the most logical step. I also believed that this was the next logical step for women. Women need to ensure security for today and tomorrow. Plus, I could earn a lot of money by investing it, and someday donate generously to my favorite social justice organizations. At one point I had saved $13,000 in a life insurance account (having never saved more than the requisite $50 in my savings account, this was a banner achievement.). The goal of this growing account: pay my debts and loved ones if I were to pass away. Again, it seemed wise. Then, one day after meeting with my planner, I walked down the street nobly as a financially responsible woman in my early 30s and walked past a homeless man. I stopped and talked to him about the changes in the weather; a local election and if we thought the candidates were truly qualified; and which warms you up more: coffee or tea. He preferred coffee. Later that day, I thought of my $13,000. What was it doing in that account? Shortly thereafter, I withdrew it all. Since then, I never had a 401K, life insurance, or disability account. And I've never felt more joyful. I used to think I wasn't saving enough or putting it in the right place. I used to think I had to make my money work for me. These days, I think about today. I know that it all seems naive. And since coming out as a non-saver-for-the-future, I've heard all the arguments against my approach: "What if you contract an illness and insurance won't pay for it?" or, "What if you're in an accident and can't work anymore? You'll lose everything!" All of these assertions make sense. But I believe that if I'm ever in trouble or in any dire need, I can call upon the people in my life to help me. I would not feel ashamed. I would not feel like a burden. It has been my joy and privilege to offer financial and emotional support people I know, as well as those I don't know. And I know that today, if I were to put an announcement on Facebook that said, "I'm in trouble and need help," at least 200 people would be at my front door. I would not hesitate to send money to post-Katrina survivors to help a family pay for food and clothing. Why then would I hesitate to do this for someone I know? Someone needn't be destitute to need help. Sometimes all of us can use a hand, a bridge from here to there. When did we lose the idea that community is here to support our total wellness, including financial? Did we ever have it? I'm not sure I'm old enough to know. If we did, I'd like it back. If not, I'd like to build it. In short, my financial plan is the exchange between me and my global, extended family. And if they'll have it, I am their financial security plan. I feel more secure about my future when I look into the eyes of the people I love than I ever did looking at the ever-changing balance on my 401(K) statement. Security, then, is not sitting at my kitchen table, biting my fingernails while I worry. Security to me is not declining a request for financial assistance from a person or a non profit because I might need it in 50 years. To me, and it may just only be to me, security is my abundance of human resources. And I pledge to always be a safety net to others whenever I can, in all ways that I can, whenever I can until we achieve a world where all of us-including the homeless man that likes spring and hot coffee-have a community that we can depend on. 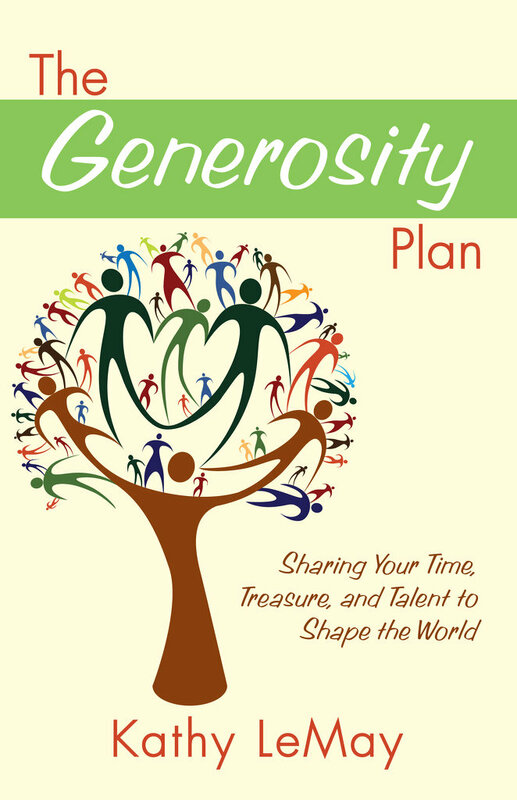 Kathy LeMay's newest book is called The Generosity Plan: Sharing Your Time, Treasure, and Talent to Shape the World. Learn more at www.thegenerosityplan.com.